Found this tin, made in England by HO & WD Wills - manufacturer of Capstan-, James B. Russell (NH) as the US distributor. It looks like a pipe tobacco tin and is 3 1/4 oz. I did some research and found out it was created and released as pipe tobacco in the 1870s, but became popular quickly as cigarette tobacco. So, I was wondering if anybody was familiar with this one: did I buy pipe or cigarette tobacco? You bought cigarette tobacco. 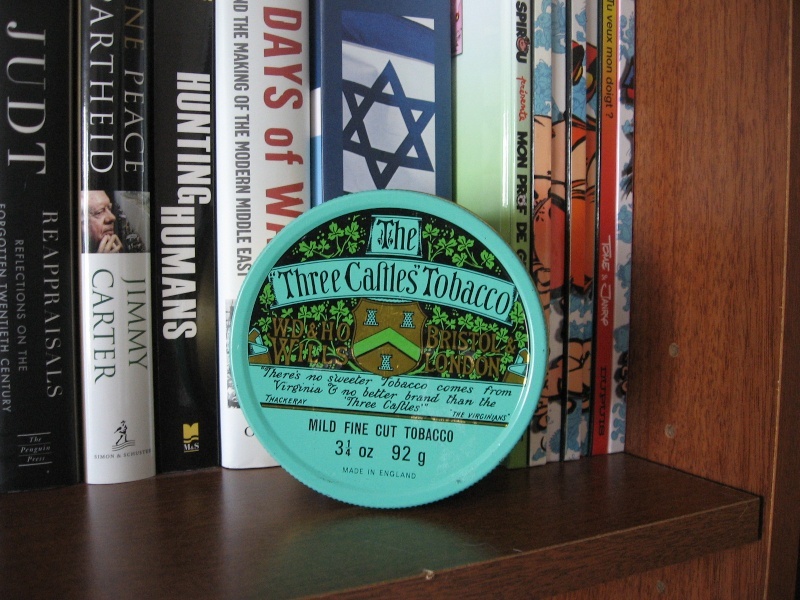 However, I smoked a few tins in the early 1990s, and liked it as pipe tobacco. Puff it at a slow to moderate rate, and it has a nice Virginia taste. You're lucky. D&R Three Sails is very, very close to that blend. I'd say it's the same. Thanks for your responses, gents. I will try it in a pipe if you liked it as such, Jim. One thing is for certain, that's a cool looking tin. It looks like a pipe tobacco tin and is 4 1/4 oz. Though I never smoked it I served with a Scotish doctor back in '69 in 'Nam who did smoke it as cigarette tobacco as he rolled his own. But his was always in a pouch and he said that the pipe tobacco was similar but it came in tins. I'd say you have some 'baccy from the early to mid '70s as it still says "Made in England" and the wghts, done in ozs ANS grams and has no markings about the EU on it. British tobacco tins started putting EU eferences on their tins by the late '70s. It's probably a bit on the dry side but you can rehydrate it I sure. It ought to be some VERY nice MELLOW smoke by now !! A simple, uncomplicated flue cured Virginia with natural citrusy sweetness and some grass and hay. I also got a few familiar notes that reminded me of Sir Walter Raleigh Aromatic. I'm not comparing those two blends because they are different (e.g., SWRA has a topping and this does not), but they both must have a similar type of Virginia. Puffed at a slow to moderate rate, it didn’t bite or get harsh or amazingly cigarette-like, though you may have gotten some of the latter no matter how slow you puffed. Puffed fast, and you risked all of that and more. Left no moisture, and being a dry shag cut, burned quickly, but not hot if you paced the smoke. Had a nice nic-note. A nice all day non-complex smoke with pure Virginia flavor. Three Castles was designed to be both a pipe and a cigarette tobacco, though I only smoked it in a pipe. I smoked several tins of this in the mid-1990s, and as I have not smoked the latest version - which I am told (by D&R blender Mark Ryan) is exactly the same blend as what I experienced - I wrote my review in the past tense. Mr. Ryan had a hand is bringing Three Castles back, and also sells it in the US as Three Sails under the D&R brand. I smoked Three Castles in the late 50s with my first love, and in the 60s in San Francisco. I had it in a pouch and in a tall tin. Both seemed the same. I smoked in a pipe (as someone said "gently, slowly") and rolled cigarettes too. It was very very fine, soft and sweet, and did smell like lovely hay & grasses. A most beautiful smoke! Hmmm, I guess I will have to smoke it, then. Thanks for sharing your impressions.